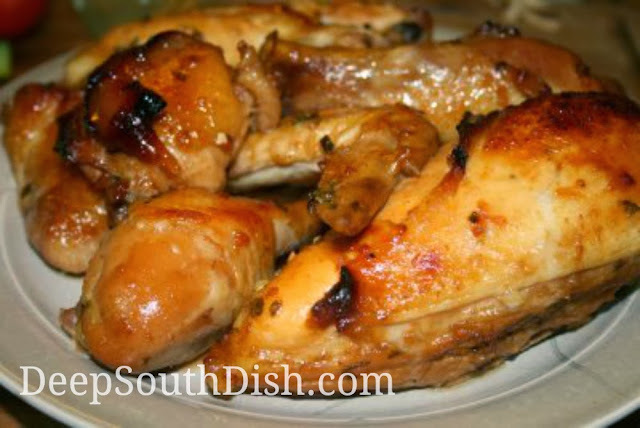 Whole cut up chicken marinated and baked in a honey, orange and soy garlic ginger sauce. This chicken offers a fantastic contrast between the tang of the hot sauce with the sweet orange and honey against the traditional flavors of soy and ginger in this dish and is a pleasant surprise from more typical honey and soy combination for chicken. Frequent basting produces a pretty glazed surface and pulls double duty as a very tasty side sauce as well. Just delicious and The Cajun absolutely loves it. The best part? It's super easy to put together. Combine all of the marinade ingredients into a bowl or container. I find that a Pyrex measuring cup works great and makes an easy job of pouring into the bag too, so I squeeze the juice right into the cup on top of the honey, add the soy sauce, and the rest of the ingredients go in as I chop. Using a pair of tongs, transfer the chicken to a zippered storage bag and pour the marinade over the top. Notice how I've folded over the top zipper part? That helps to keep it clean so that it seals nice and tight. Seal the bag and squish the chicken around to coat it well all over. Lay the bag flat in the refrigerator and let it marinade for 2 hours. Every once in awhile pick it up, squish it around and turn it over. Dump the whole thing out into a foil lined baking pan and arrange the chicken so that the largest parts are facing toward the outside of the pan. Bake in a preheated 350 degree oven for about 45 minutes to 1 hour, depending on the size of your pieces, basting several times. When done, set the chicken aside to keep warm, pour the sauce in a skillet and reduce until slightly thickened. Transfer to a platter, serve with rice or noodles and spoon some of the sauce over the top. Add a nice garden salad or green veggie and gobble it up! Combine the marinade ingredients and whisk together; set aside. Place the chicken pieces in a zipper bag and pour the marinade over the top, turning to coat the chicken well. Place bag into the refrigerator for 2 hours, turning occasionally. Preheat the oven to 350 degrees. Place the chicken in a foil lined baking pan and pour the marinade over the top. Bake for 45 minutes to an hour depending on the size of the pieces until chicken is cooked through, basting and turning pan occasionally. Remove from the oven when the breast has reached 165 degrees and the thighs about 170 degrees on an instant read thermometer; keep warm. Pour the pan drippings into a skillet and bring to a boil. Reduce heat to medium and cook until reduced and slightly thickened, about 15 minutes. Finish with a splash of rice wine vinegar, if desired and drizzle some of the pan sauce over the individual serving pieces. Garnish with sliced green onion and serve additional sauce on the side. Cook's Notes: May also use a cornstarch slurry to thicken, rather than a reduction. I like to use a sweeter hot sauce like Tiger Sauce with this recipe, though any hot sauce is good. For the Slow Cooker: Remove skin from chicken and lightly season with salt and pepper. Brown in hot oil and transfer into a slow cooker. Whisk together the marinade, omitting the parsley, and pour over the chicken. 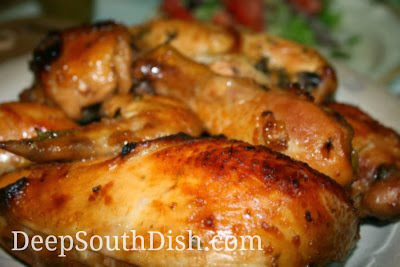 Cover and cook on high for 3 to 4 hours or on low for 6 to 8 hours for mixed chicken or bone in dark meat. Cook boneless, skinless breasts on low and check at 4 hours. Remove chicken and keep warm and either transfer juices to a saucepan to thicken, or thicken juices in the slow cooker with a cornstarch slurry of 1 tablespoon of cornstarch with just enough water to dissolve. Stir in parsley, add slurry, bring to a boil, cover and let cook on high another 20 minutes, or until mixture thickens. Turn cooker off, return chicken to the pot, stir to coat and warm through. Where does one find 'Tiger Sauce'--I've never heard of it! This recipe sounds really good-would it still be as good without the 1/2 tsp of the above sauce if I can't find it? Ooops Amy my bad - I usually link that to Amazon just to show people what it is (since the shipping there is more than the product unless you order a few things) Anyway, I'll fix that link so you can see it. It's a type of hot pepper sauce with Worcestershire and sugar that gives it a bit of a sweet tang. You can totally eliminate it or use a little regular hot sauce. It's generally found around the area where they keep the hot sauces and steak sauces, on the condiment isle. Sorry about forgettin' that link and thanks for stopping by! I've bought Tiger Sauce at Wal-marts before. Ooooooo Rebel, I hope you're gonna share & post that Cuban recipe??!!?? We enjoyed this very much for dinner last night. It took no time to put together. I would like to try this again with pork chops as well. Maybe fried rice as a side??? It sure was good, especially on a hot summer evening. I too was able to purchase the Tiger Sauce at Walmart. Thank you this was wonderful! Mary, thanks for a great recipe! I just found your blog and am in need of more 'home style recipes' after all the 'chefy recipes' that many blogs present. I thought I'd try this with skin on, bone in chicken breasts. They were huge; three totaled 3.5 lb. Yikes! It was wonderful! I did cut back on the hot sauce (that was a mistake! ), but I de-fatted the sauce and drippings from the pan, reduced in a sauce pan then thickened it by adding a corn starch slurry while the meat rested. Poured some over each portion when I served it. It was so glossy and delicious! (Guess I got a little 'Chefy'!) Anyway, I am gonna have some fun messin' with this recipe and can't wait to try some others as well. Especially 'Bacony Chicken and Rice', which is how I found you in the first place. And there comes a time in every man's life when he needs to learn how to make Gumbo. You're very welcome, and yes, my blog is certainly more about homestyle versus chefy, that's for sure! I always say I'm just a home cook like every body else and I'm not too much of a photographer either, so I just can't & don't care to try to compete with all of these other bloggers out there. I'm just having a good time sharing what happens in my kitchen and hopefully helping some folks find their own zen in the kitchen! I'm so glad that you gave the chicken a try and thanks so much for letting me know you enjoyed it!